Isabel Marsh, who is currently on placement at St Cassian’s Centre, reflects on her time in El Salvador before she embarks on her fundraising journey 0 the Colchester half marathon. Less than 12 hours after arriving in El Salvador, our group set off for the University of Central America (UCA) to meet with one of CAFOD’s partners. The UCA is a private university, meaning they are able to charge fees for students (but there are several scholarships and bursaries available) and are not reliant on government funding. This has meant the University has more autonomy and does not need to follow the views of the government, providing it with an independent and non-biased voice. We were led to the Social Outreach Vice-Rectorate, for our meeting with Omar Serrano, the Vice-Rector. We spent the morning with Omar and his colleague Eduardo. Omar shared with us about El Salvador – its history; politics; society and social norms and economy. CAFOD Step into the Gap volunteer Siobhan Doyle, who is currently completing her placement at Newman University, shares her experience of meeting CAFOD’s partners in Sierra Leone. 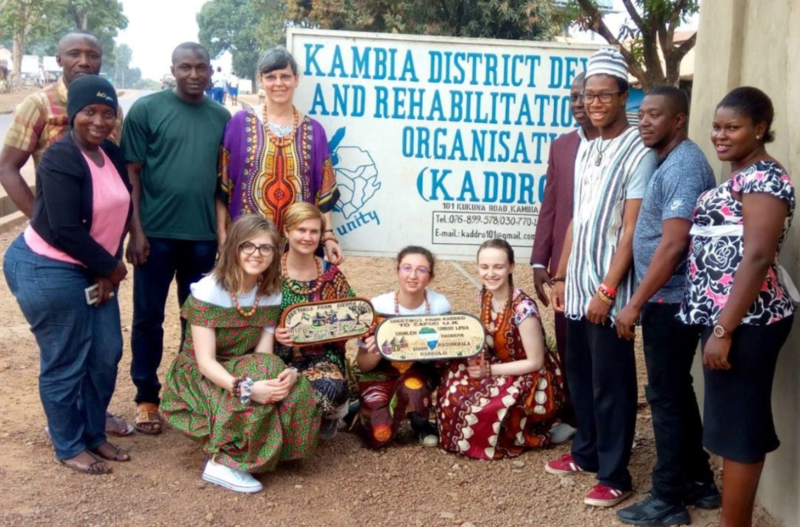 We have spent a week in Kambia visiting CAFOD’s partner – The Kambia District Development and Rehabilitation Organisation, KADDRO for short. The staff have been so welcoming and so willing to answer all of our questions. We visited three rural communities in Kambia where KADDRO works on access to water, sanitation and health, savings and loans groups, ways to make a living projects and women’s breastfeeding and pregnancy groups. 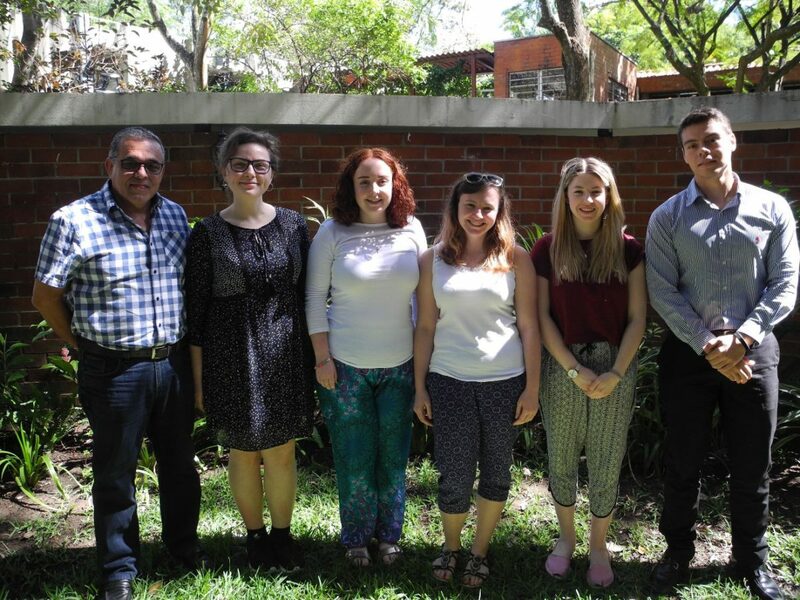 CAFOD gap year volunteer, Aleks Adamczyk, who is currently on placement at St Mary’s Catholic Academy, Blackpool, reflects on meeting CAFOD’s partners in El Salvador and Nicaragua. 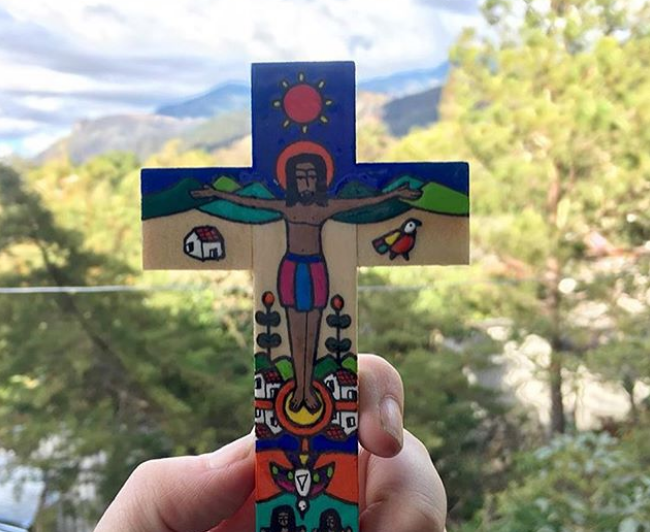 CAFOD gap year volunteers, Ciara Hogan and Sophie Aulton, who are currently on their placements at The Briars and Leeds Trinity University, reflect on hope and sustainability in El Salvador. 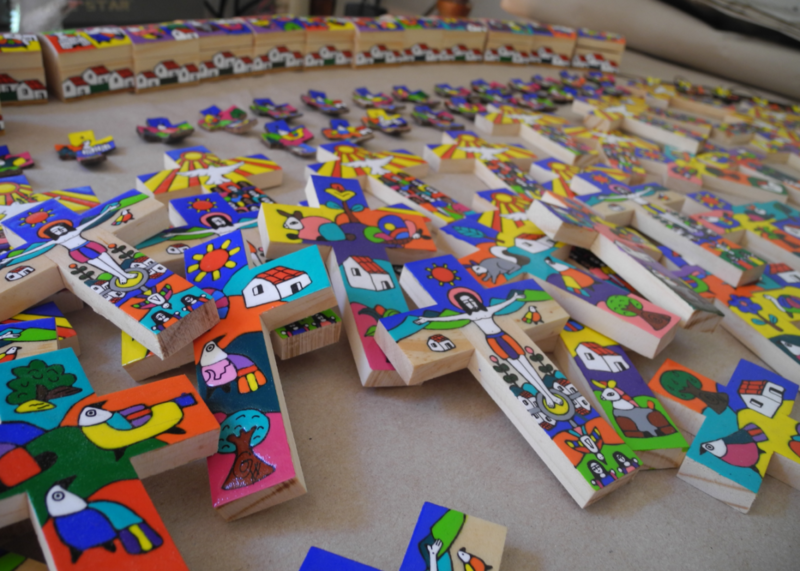 CAFOD Step into the Gap volunteer Ciara Hogan shares her experiences of arriving in El Salvador, meeting CAFOD’s partners and seeing inspiring, creative projects. Our first few days in Central America have been absolutely incredible. In the short time we’ve been here we have already experienced so many different people and places, each giving us so much to think about and reflect on. One of those experiences was our visit to La Palma, a town in the mountains of El Salvador bordering Honduras. This was our first visit to a family since we arrived. 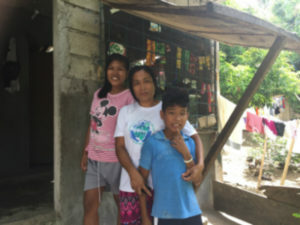 Maggie Mairura from Nottingham shares her experience of a recent visit the Philippines to meet communities to who were helped after a devastating Typhoon. Having stayed overnight in Sorsogon, we were up early on Sunday morning and left at 6am in the pouring rain. Much to the annoyance of our companions, myself and Ged Edwards, who I was travelling with, sang some songs with ‘rain’ in the title! We were soon silenced by breakfast sandwiches and a hot drink!! 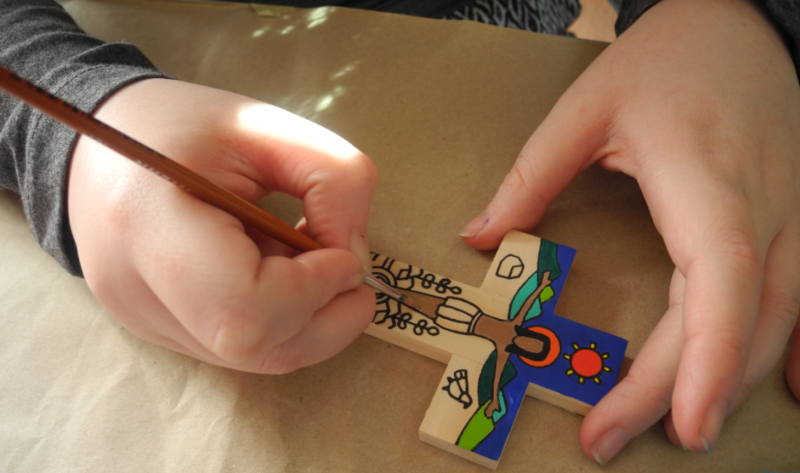 Find out more about our emergency work. 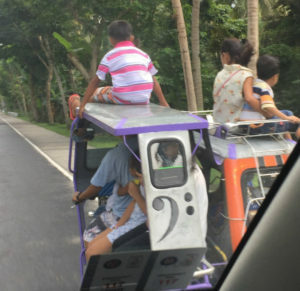 The two-hour journey took us south to the barangay (village) of Daganas, outside the town of Bulan. The roads were framed by rice fields, coconut and banana trees. In some parts, the roads were edged with bamboo houses and shops, with washing hanging out to dry. Once we turned off the main road, we continued a good 30 minutes along lanes which got narrower the higher we went, dogs nonchalantly lying in our path, moving at the very last minute, just to let us know who was boss. In parts, the lane turned to tracks and we eventually arrived at Daganas. We were warmly welcomed by barangay captain, Jimmy, who invited us into his office, just off the basketball court, the centre of the village. Medina outside her new sturdier home. As we sat with him I noticed a group of women outside, looking in through the window so I excused myself and went out to meet them. They were all very keen to show me their new houses and Medina escorted me up the steep steps to her home. She explained how her previous home, made from bamboo, had been destroyed during Typhoon Melor (Nona) in December 2015 and how she was now very happy with her sturdier new home. Watch some of our emergency response training. She lived there with her husband and 5 of her 8 children. The three eldest were in Manila working in fast food restaurants and sending home essential financial support. We headed down the steps and one of the women caught my attention and off we went to see her pig. Anna was the recipient of the livelihood scheme and had been given a sow. Once a litter arrived she was required to ‘pass on the gift’ and give one of the piglets to her neighbour. We continued through the back lanes of the barangay passing a family washing their clothes, livestock of ducks, hens and turkeys scurrying around, pumps for drinking water and general water use. 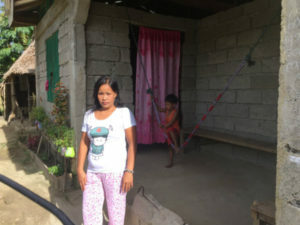 We then met Melanie who as well as having a new sturdier home also had a co-op (sari sari) shop, one of 3 in the barangay. Melanie and her new sari-sari shop. It was obvious that they were all very proud of their new homes and the means of providing for themselves and their families. There was also dignity in that they could provide not only for themselves but for their neighbours. As part of the programme after the typhoon, the community is encouraged to work together in self-help groups not only to sustain their community but also to be prepared for the eventual arrival of another typhoon! However, they felt more secure in the knowledge that their new homes would survive the next one. Wherever we travelled we saw large posters informing people that July was National Disaster Consciousness Month and that drills would be taking place nationwide. It certainly puts into perspective how we respond when we have a few flakes of snow! Donate to our emergency work. 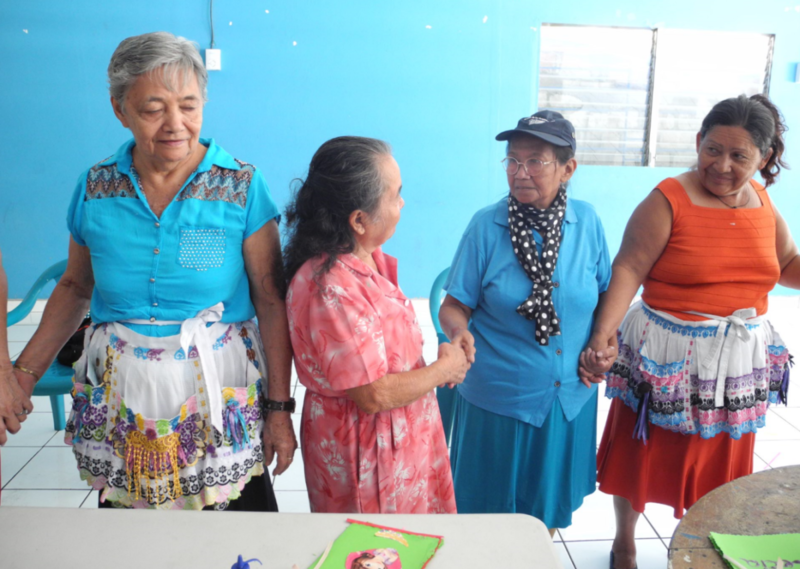 As we made our way back to the minibus, the women began to ask me about my family and my work. I took out the photos I had brought for the trip and introduced them to my family. I had also taken some photos of our volunteers and I explained to them how our volunteers respond to emergency appeals and how we work through praying, giving and acting to support projects like the one here in Daganas. It was very humbling and moving to connect our volunteers with recipients of our appeals. My overall experience of the emergency work and sustainable livelihood programmes is that NASSA/Caritas Philippines goes to communities that local and national government are not interested in – they go to those at the end of the tracks.